WP RSS Aggregator lets you fine-tune the feed processing system on a feed source basis. The Feed Processing metabox gives you control of the following aspects of your source: Feed state, Scheduling, Update interval, and Deletion of old feed items. Every feed source can be set to Active or Paused. This allows you to quickly stop some feed sources from being processed, without the need to delete the source altogether. This is ideal when you need to pause importing temporarily, say for a few days. Another handy feature is the ability to set a schedule for the processing of a feed source. This is ideal for feed sources tied to seasonal events. You can thus set a feed to process for, say, one month a year only. During that period it will be set to Active and after it will go back to the Paused state. 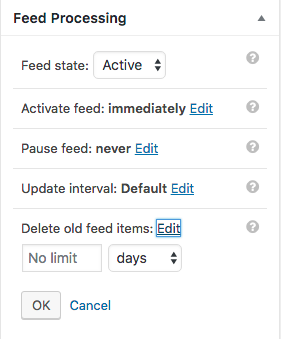 In the General Settings of WP RSS Aggregator, you can set the feed update interval, but you can also do so on a feed source basis. Thus if you want to update one particular feed source more frequently than the others, this is the option you need. Setting update intervals on a per-feed source basis can speed up overall processing since you will be updating some feed sources very frequently, while others that don’t need such short update intervals won’t be processed that frequently. You can also set the maximum age allowed for feed items. This is a very useful feature if, for example, you’re only concerned with last week’s news. Any items already imported will be deleted if they eventually exceed this age limit. Also, items in the RSS feed that are already older than this age will not be imported at all. If you’d like to use the Limit feed items by age setting in the general settings, you can leave this option empty.